binboonin 貧乏人 Bimbo, "a poor person"
Daikoku is a god of wealth. In Issa's time, the daikokumai were troupes of begging musicians who performed between the 11th day of First Month and the first day of Second Month.
. Poor Monk (dooshinboo 道心坊) .
. WKD - kojiki 乞食 beggar . kojiki no yo 乞食の世　"A Beggar's world"
Today, on the 26th day of the Third month in the Third year of Kansei [April 28, 1791], I left Edo and set out with more than a little anxiety on a journey. The frogs in the rice paddies proudly sang out their songs praising spring, however, and the dawn moon, caught in the limbs of trees, grew fainter in a light mist. As soon as I took my first step, my heart was filled with nothing but thoughts of travel. The hokku is from the opening section of a haibun travelog entitled A Trip in the Third Year of Kansei (Kansei sannen kikoo 寛政三年紀行), probably Issa's first such haibun travelog, although he may have kept a record of his haikai trip to the north in 1789 that was subsequently lost. The journey in 1791 was made to visit his father after saying goodbye to many Katsushika-school haikai poets and supporters, who would also give him contributions to help pay for his journey. He got a further contribution from Somaru, the head of the Katsushika haikai school, for whom he was working as an assistant and scribe after the death of his first haikai master Chiku-a, who had named him as his successor as a master in the Katsushika school. In order to become a true master, however, Issa needed to publish more, gain more experience, and get to know Chiku-a's many colleagues and students in the Kyoto-Osaka area. Issa hoped to make a whole series of trips, but he told Somaru he would be gone only a month to see his father for the first time in fifteen years, so perhaps he gained confidence from this trip and only then decided to set off for western Japan. 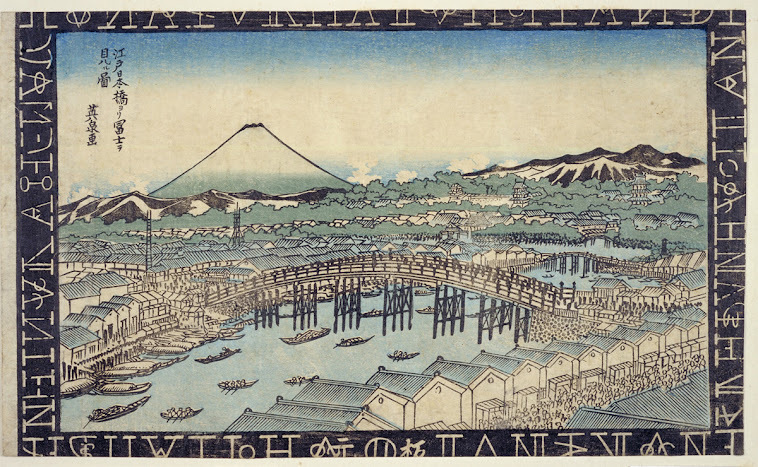 After returning to Edo, he continued to prepare for his long trip and receive contributions, and at the end of the Third Month (April) in 1792 he set out on a series of journeys that ended up continuing for seven years. The first section of the travelog, partially translated above, is quite humble and presents Issa as a fairly weak and frail ordinary person who is setting out to try to reconnect with his father and to learn more about haikai and the world. The suffix -bou in the haikai name Issa was using then, Issa-boo (一茶坊), can mean either a Buddhist monk or a devout person who isn't a monk but who has dedicated himself to Buddhism. I would translate the name as "Secular Mendicant Issa," since Issa feels haikai is the best way he can contribute to the world and that it is a spiritual medium for him. He wears traveling robes that are fairly similar to those of an actual mendicant monk, but he obviously does not think of himself as a monk who has taken vows and entered an order. In fact, in a later section of the travelog, Issa writes about how ashamed he felt when the woman at one house where he was able to stay the night, believing him to be a monk, asked him to pray for her dead son (see my post of 5/6/2013). Issa's first master Chiku-a, also not a monk, nevertheless traveled widely around Japan and was devoted to Amida Buddha, and Issa seems to be following Chiku-a's example. At this stage in his life, the humble name "Issa" seems to have meant either a single cup of tea or perhaps the bubbles or froth on the surface of tea when hot water is poured on the tea leaves in a pot (or when green tea is poured into the large cup used in the tea ceremony). Issa is obviously conscious of Basho, since he starts his journey one day before Basho set out for northern regions, and the last part of the haibun translated above is a clear reference to passages in the first part of Oku no hosomichi (Narrow Road to the North). The tone of the earlier part of the opening section, however, is closer to Basho's anxiety about dying on the road expressed at the beginning of Records of a Roadside Skeleton. Issa has even less travel money than Basho, and the contributions he receives aren't enough for his journey, so he feels he's somewhere between a mendicant monk and an ordinary beggar. When he sees other beggars, he no doubt wonders how different he actually is. He leaves at the end of April, just before the beginning of lunar summer, and beggars are no doubt staying outdoors a lot more now, so Issa probably passes some as he begins his journey. 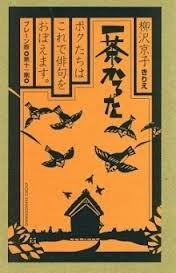 The hokku can be translated in various ways, but I follow Kaneko Tota in seeing a fair amount of humility in it as well as sympathy for and kinship with the beggars who now sit beside the road under trees and other forms of shelter. Perhaps many of them also sleep under trees in the warmer weather. For this reason, I don't take the plum tree to be covered with blossoms. There are many varieties of plum trees. In the Edo-Tokyo area, some bloom in January and others in February and March or even a few in early April, but by the end of April the plums are mostly putting out green leaves, though perhaps some blossoms remain here and there. I take the tree in the hokku to be almost finished blooming and no longer a tree people come to view. The "world" of the tree has changed. This would actually be in the spirit of the Oku no hosomichi passage Issa alludes to in the haibun. There, Basho wonders when he will again see the blossoming cherry trees in Ueno and Yanaka, even though these trees finished blossoming several weeks earlier and Basho is alluding to a waka by the monk-poet Saigyo and will soon write about the new green leaves at Nikko. Issa doesn't mention either blossoms or leaves, so I simply take the plum trees near Edo to be mostly green now and no longer visited by admirers. Their place is now taken by beggars, with whom Issa feels uncannily close. Undoubtedly some local people look with disrespect on the beggars, and Issa may be trying to capture their coldness and emotional distance with the image of male pheasants crying their sharp, almost screeching cries. The males' metallic yet strong cry is assertive and hardly seems friendly to most humans, though no specific meaning can be attributed to it. Are the pheasants crying because a beggar has invaded their territory around a plum tree? Are they just inspecting a new part of the environment? Does their cry remind Issa of the indifference toward him shown by many leading Edo haijin and of other difficulties he must overcome if he truly wants to become a haikai master? How can he go beyond begging and become a self-supporting haikai master while still retaining the free, outsider spirit possessed by beggars, such as the one he sees under that plum tree? This fairly realistic hokku seems to be a large question mark that is to be placed after each of the many sharp (pheasant-like?) questions Issa will ask himself in this psychologically searching travelog. Many apologies. Unfortunately I didn't have time to translate the whole travelog! This hokku is from the end of the 10th month (early December) in 1810, when Issa was traveling around to several shrines and festivals and meeting haikai poets just east of Edo. The 10th month was very important for the god Ebisu, one of only a very few gods who did not leave and spend the 10th month at the ancient Izumo Shrine at the southwestern end of Honshu. Since most gods were away, the 10th month was called the Godless Month. Ebisu, meanwhile, was very popular then, and merchants, fishermen, and farmers all had festivals to Ebisu, a god of good fortune and fertility. Perhaps the biggest festival was the Ebisu-kou festival at which merchants thanked Ebisu, the god of wealth, for their profits and begged forgiveness for their secret cheating and lies to their customers. It was held on 10/20, about a week before this hokku was written. The phrase asa-ebisu or "morning Ebisu" is not a synonym for early in the morning but a short way of referring to making early-morning pilgrimages to a local shrine to the god Ebisu in order to pray for business success. From this basic meaning developed two others: a) businesspeople and fishermen would pray to Ebisu in their shop or warehouse or boat the first thing in the morning and ask him for good luck during the day; and b) businesspeople would euphemistically call early-morning customers "Ebisu," as if the customers were the god Ebisu rewarding the merchant or wholesaler with money. Issa makes his own riff on this phrase. The first snow of the winter has fallen, and while Issa is looking at things in wonderment a beggar arrives at the front door or possibly at the gate of the place where he is staying. After Issa gives him or her a coin, the beggar thanks him by calling him Ebisu, as if he were a god. Evidently the beggar, like a merchant, calls patrons Ebisu, since they are the source of his/her wealth. Issa was already a bit disoriented by the sudden sight of snow, so the beggar' s polite thanks seems to have an uncanny ring of truth to it, as if both of them were momentarily in another time and space.
. WKD : Ebisu and Ebisu koo 夷講 . This hokku, scribbled in a margin of Issa's Record of a Journey to the Western Provinces (Saigoku kikō 1795), was probably written on or around lunar 5/5. The Record ends on 5/1, when Issa is in Taka-ishi, a town near the city of Sakai on the Inland Sea just south of Osaka, so the hokku may have been written in the Osaka area. During Issa's many travels to western Japan in the 1790s he wrote several hokku that mention "the reign of the present ruler [i.e., the shogun or the emperor]" (kimi ga yo). The phrase has a temporal orientation, and when kimi ('lord, ruler, you') is mentioned in worldly contexts it usually refers to the current age under the present regime (the shogunate), though in ritual contexts, such as at New Year's, it often refers to the emperor (or imperial rule). Literally it means "during the life or reign of the sovereign/ruler," and yo means 'the distance between two joints on a bamboo; life, lifetime, year(s), reign, season, society, human relations, human world.' In Edo the phrase usually referred to the shogun in almost all contexts, while in Kyoto it usually referred to the emperor, so location also governed the meaning of the word. Before the Tokugawa shogunate enforced peace on the country, it had been ravaged by terrible wars for several centuries, and although Issa was not fond of the samurai class, he appreciated the fact that the shogunate had ended the many civil wars that afflicted medieval Japan and that it had maintained peace for two centuries. Peace also meant gradual economic development, and Issa's hokku seems to be about a village of semi-outcast beggars (hinin), as opposed to hereditary outcasts (eta). Even these semi-outcast beggars, who are required to live in a separate ghetto-like village, receive enough these days to have small houses, and they obviously love their children just as much as everyone else. It is the time of the Children's Festival on the fifth of the fifth month (early June), and the beggars, too, raise long, colored wind-sock-like streamers (nobori), many in the shape of carp that flutter in the wind as if the carp were vigorously leaping up over a small waterfall, an image they hope will inspire their children to have big dreams and aspirations. The children of beggars were able to leave the class into which they were born, and no doubt the beggar parents in the village are praying their children will have a better future, even if the children have to go away to a city to find work. Issa no doubt sympathizes with the prayers of these parents. The hokku seems to be mainly about the beggars' humanity and their hopes for their children under the Tokugawa shogun's dictatorial but peaceful reign, and it does not seem to be nationalistic or express jingoistic pride. The phrase kimi ga yo ("under the present ruler") began a new career after Issa's death, however, so a brief look at history may be useful. The word kimi appears often in ancient waka, where it means 1) "you" when referring to a lover or respected person, 2) a powerful person or local lord, or 3) the emperor. The most famous use of the phrase is in Kokinshu waka 343, which is a poem praying for the very long life (yo) of an esteemed person. Later, during the medieval period, the waka's first line was changed slightly to kimi ga yo, and its words became a popular song sung at parties and ceremonies, such as weddings, where kimi, 'you,' referred to the newly married couple or the person being feted. In Issa's time, as he surely knew, it was even sung as a kouta song in urban amusement districts as an auspicious blessing song for an esteemed "you," often a lover. Although kimi ga yo could be taken to mean 'the reign of the current emperor,' it more commonly meant 'the reign of the current shogun.' The shogun was regularly referred to as kimi both by members of the samurai class and by commoners around the country, except in the Kyoto area, and 'the current shogun's reign' usually included the sense of "in which the realm is at peace and prosperous." The period of rule of a local daimyo domain lord was also referred to by local people as kimi ga yo. Therefore it seems likely that in this hokku Issa is following the most common usage of his age and referring to the so-called "Tokugawa peace" under the shogunate, the actual rulers of Japan. Since kimi could be singular or plural, it might be possible to read Issa as referring to "the reign of the present shogun and emperor," but it was only under the shoguns and their warrior regime that Japan achieved long-term peace and increasing prosperity, so the shogun seems more likely here. The once-common usage of kimi that referred to the shogun is rarely mentioned in contemporary Japanese schools or small-sized dictionaries, since forces opposing the shogunate overthrew it in 1868 and made the emperor the sovereign, an active imperial role that lasted until the end of WWII. The emperor is still a "symbol" of Japan, although some popular revisionist histories still claim kimi has always referred solely to the emperor. Only in large dictionaries such as Suzuki Katsutada's Zappai Dictionary (Zappai-go Jiten Tokyo-do 1968) will you find kimi ga yo defined as 'in the present shogun's reign.' You can also find many examples of the phrase referring to the shogun in haikai, including in renku by Saikaku, who lived in Osaka. It is therefore doubtful that Issa is here connecting kimi ga yo either with Japan as a nation in relation to other nations (he would probably have used 'Nippon,' 'Dai ['great'] Nippon,' or perhaps 'Kami-guni' ['divine country'] instead, as he sometimes does) or with Japan's national anthem, since Japan had no national anthem until 1888. The anthem was created then based on -- but transforming -- a popular Edo-period blessing song version of kimi ga yo sung at ceremonies and auspicious occasions. The new Meiji government declared that kimi referred not to "you" or to the shogun but only to the emperor. Japan's first national anthem thus became primarily a song praying for the emperor's long life, and its nationalistic overtones became very strong in the first half of the twentieth century. The meaning of the phrase, however, is still contested, and contemporary Japanese politicians continue to debate whether the national anthem refers to "you, the emperor" or "you, the Japanese people"! Issa himself surely could not have guessed kimi ga yo would later go through these rapid, radical changes in meaning, and it is doubtful that he uses the phrase with nationalistic overtones. Instead, he seems to be praising the aspirations of contemporary beggars while also praising the progress being made during the long period of peace that is continuing under the present regime. I did use the current name of the 5/5 festival, Children's Day. I realize it's not perfect, but I used it because I thought things would get too complicated if I mentioned all the various customs related to the Tango no Sekku festival complex. I also wanted to avoid the misleading term Boy's Festival, which is commonly encountered, since the Tango festival was traditionally not just for boys, except perhaps within the warrior class. Among commoners, especially in rural areas, the village young men's and young women's associations usually held celebrations, 5/5 was often considered "women's house day," and the placement of sweet flag leaves on roofs and sweet-flag baths were both for girls as well as boys. This is presumably why the Japanese government now uses the term Children's Day -- since in the Edo period the 3/3 Doll festival was held for purification and not just for girls and the 5/5 Tango festival was mainly for maintaining good health and protection against summer diseases and not just for boys. Therefore I was using Children's Day descriptively, not as a name used in Issa's time. I agree that Children's Day is a little confusing, just as the historical reality is a bit confusing.
. Children's day and Carp Streamers (nobori) . This hokku is from the second month (March) of 1812, when Issa was mostly traveling around in the area just northeast of the city of Edo. Many of the fields he sees are now covered with the brilliant yellow of endless-seeming canola plants, whose seeds were a major source of lamp oil. There is so much bright yellow now that it's easy to overlook the canolas blooming in one small patch planted by a beggar using found seeds -- an out-of-the-way patch perhaps located on a riverbank at one end of the bridge on which the beggar sits. Issa doesn't mention the Pure Land here, but judging from his use of canola images in other hokku it seems possible he is implying that the beggar, too, will surely go to the Pure Land, if he is not there already in his heart. In Issa's time most beggars and outcast-class people were believers in the True Pure Land school of Buddhism to which Issa belonged, so Issa may take it for granted that beggars can find the Pure Land even in this life. In the hokku Issa refers to canola plants with the word ona, a nonstandard word from the dialect used in his hometown and the surrounding area. Since there were a great many poor migrants in the Edo area who were from his home province of Shinano, it's possible Issa is recording the word the beggar himself used to refer to his small patch of blossoming canolas. 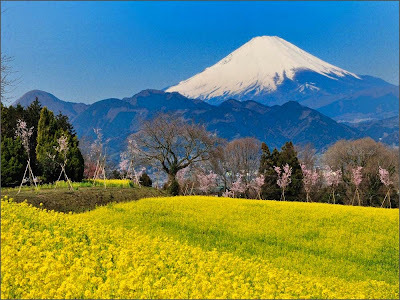 When seen from the area northeast of Edo, Mount Fuji is in the far distance, so the yellow fields here seem to gradually pass into a zone beyond measurement.
. na no hana 菜の花 rapeseed flower .
. WKD : Eta 穢多 and Burakumin 部落民 . Latest updates about Issa on facebook - CLICK to join !
. WKD : Kobayashi Issa 小林一茶 - Introduction . In 赤坂 Akasaka there lived a stupid kojiki 乞食 beggar called 亀次 Kameji. After his death, he was reborn in the family of a Daimyo. When the baby was born, it could not open its hand. Later when it finally opened its hand, the word KAMEJI was written inside.
. koyasu Jizoo 子安地蔵 Jizo as child protector . Once a group of bucket makers walked past a hall of Jizo Bosatsu and bent their head in prayer. The wife of one of them became pregnant soon after. After that a kojiki 乞食 beggar slept in the hall for Jizo, when a priest came by on a horse, stepped down and told him that a child had been born in 田山 Tayama. When the begger went there to see if this was true, he came to the home of the bucket maker. Since then the Jizo was called Koyasu Jizo.